Gilmore’s in Newquay has only been open for a few weeks, and has already got a great reputation. Friends who have eaten there have been urging me to go and try it for myself, so when Elsie invited me to visit, I cleared my diary. 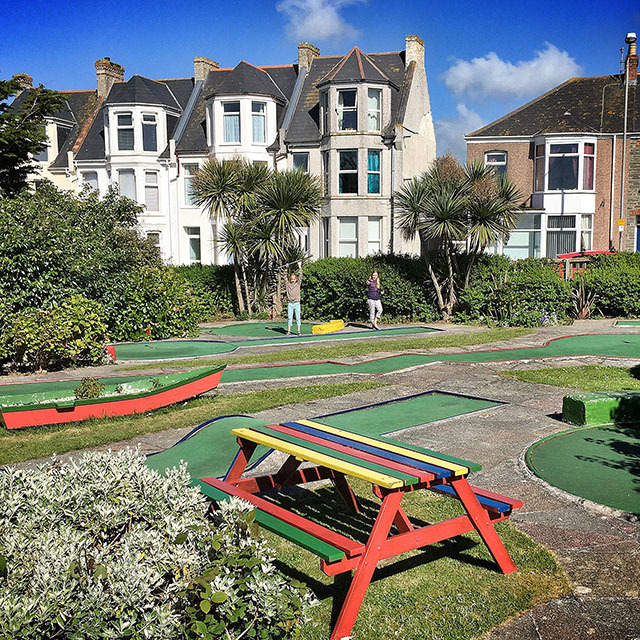 The café is situated right next to the mini golf course on Tower Road in Newquay; it’s such a brilliant idea to have a cool crazy golf café. They are open from 8am until 11pm, with the menu changing throughout the day: breakfast, lunch and dinner, coffee, cakes and cocktails. Their current breakfast offer is a breakfast burrito and Origin coffee for £5. I took my children (aged 10 and 8) after school on a Wednesday (NB free mini golf on Wednesdays during June) for a game of golf and early supper. The Caddy Shack is a little hut outside Gilmore’s, where you can pick up clubs, balls and score cards, as well as ice creams, milkshakes, drinks and cream teas. It was the girls’ first time playing, and after initially trying to dribble the ball hockey-style, they got the hang of it. So much so, they wanted to go around the 18 holes again. 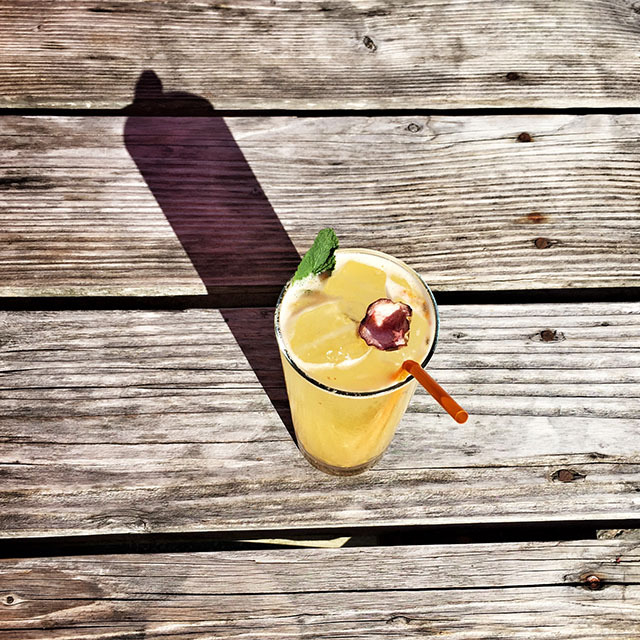 When I finally dragged them away, we headed to the café, newly redecorated with a gorgeous wooden bar, smart big tables, and super friendly staff. As it was one of the first sunny evenings of the summer, we sat outside, where there are plenty of picnic tables. I’ve heard good things about Gilmore’s cocktails, but as I was in charge of children and a car, I thought I’d better go for something non-alcoholic. The passion fruit, pineapple, mint, lime and chilli cooler was fabulous; the nutribullet is put to good use here. 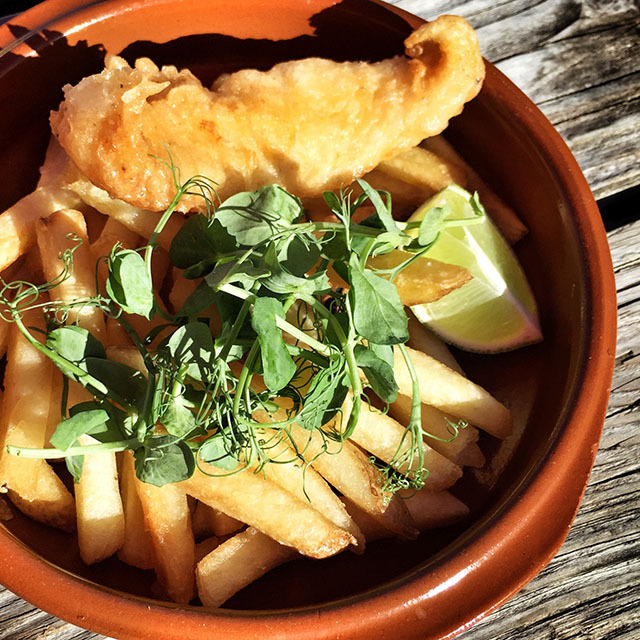 Evie chose mini fish and chips, and loved it. Sophie went for children’s fish taco, and I genuinely thought it was one of the best children’s meals I’ve seen. 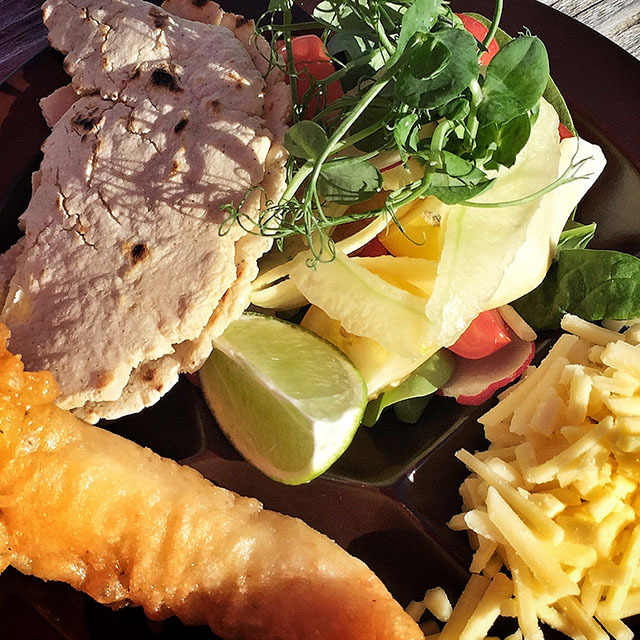 Her plate contained a homemade taco, a piece of fried fish, grated cheese, strips of cucumber, slices of tomato, and pea shoots, all ready for her to assemble how she liked. Children’s meals are a very reasonable £4.50 each. 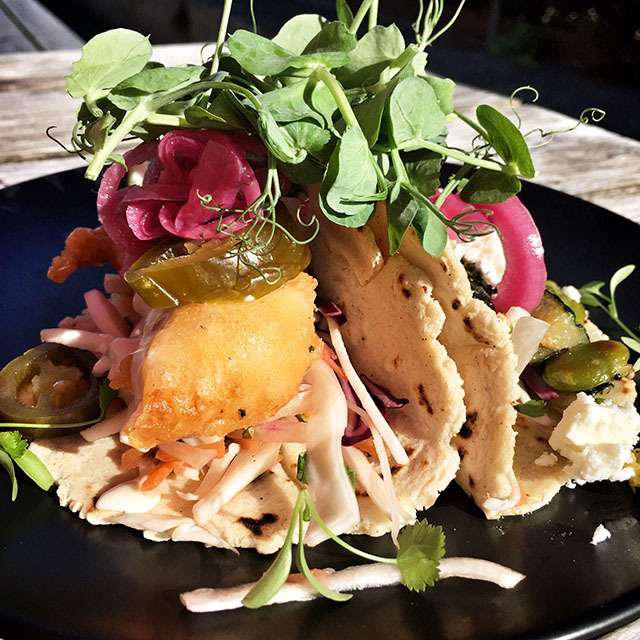 I couldn’t decide between the fish and vegetarian tacos, and I was dithering, so the waiter said I could have one of each. 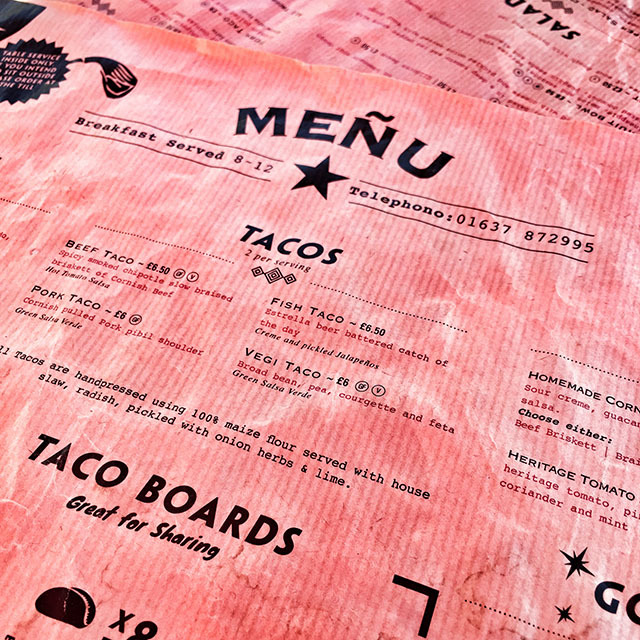 Again, these are well priced at £6-£6.50 for two, and the sharing taco boards are great value; two of each flavour (beef, pork, fish, vegi) for £18. The fish was piping hot and really fresh, with homemade slaw and topped with pickled jalapeños. Inside the vegetarian taco was a gorgeous combination of peas, broad beans, grilled courgettes and feta, with a zingy salsa verde. 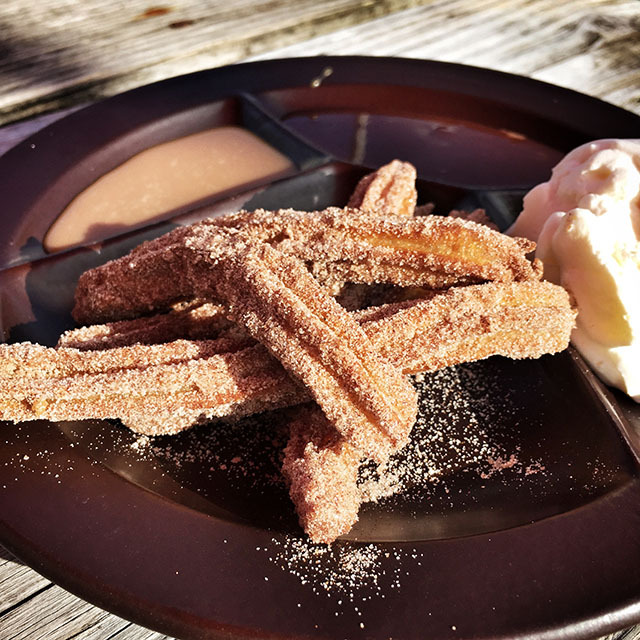 Once we had spotted that there were churros on the menu, there was no going back. The children devoured a plate of six cinnamon sugar coated churros, with caramel and whipped cream as well as the usual chocolate sauce. I thought I should try the cheesecake for variety, and the huge slice would have easily fed two. 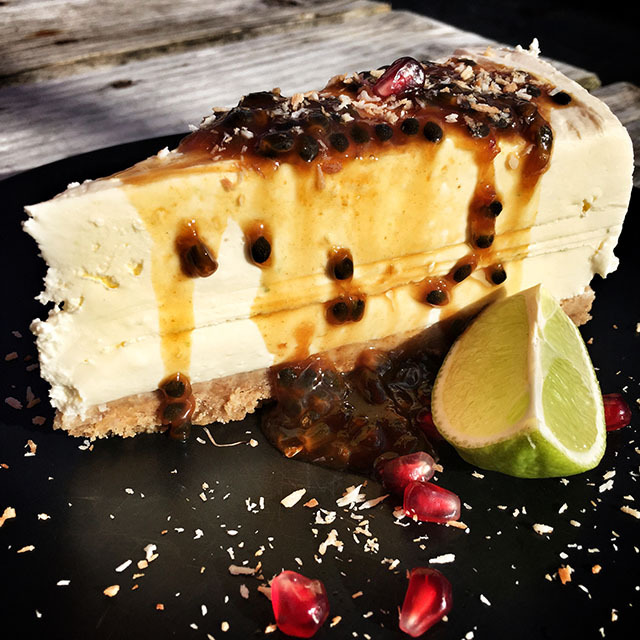 It was drizzled with a syrupy passionfruit sauce, and was heavenly. By the time we left at about 6.30pm, the café was full of families and groups of friends. The atmosphere in Gilmore’s is relaxed and friendly; the food is fresh, healthy and delicious. And along with crazy golf and cocktails, what’s not to love? Thank you Elsie and team for looking after us so well. We’ll be back!